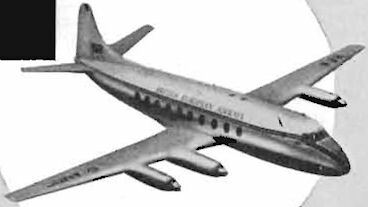 Prototype Vickers Viscount (16 July 1948). 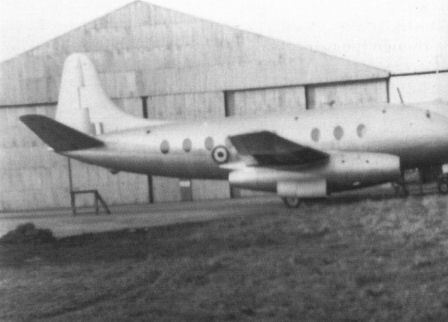 “Mutt” Summers lands G-AHRF, the prototype Viscount. 16 июля 1948г. : прототип пассажирского самолета Vickers-630 Viscount выполнил первый 10-минутный полет с аэродрома Уисли, Суррей. Самолетом управляли летчики Дж. Саммерс и Г. Брайс. Прототип V.630 успел побывать в нескольких вариантах окраски, но после первого полета под обозначением VX211 он все еще нес цвета компании "Vickers". Затем самолет получил эмблему BEA, а к началу 1950 года - полностью окрашен в цвета BEA. The new Viscount 806-810 demonstrator, G-AOYF, has the airframe of the B.E.A.C. 806 series and the more powerful Dart R.Da 7/1 Mk. 525 engines of the 810 series. 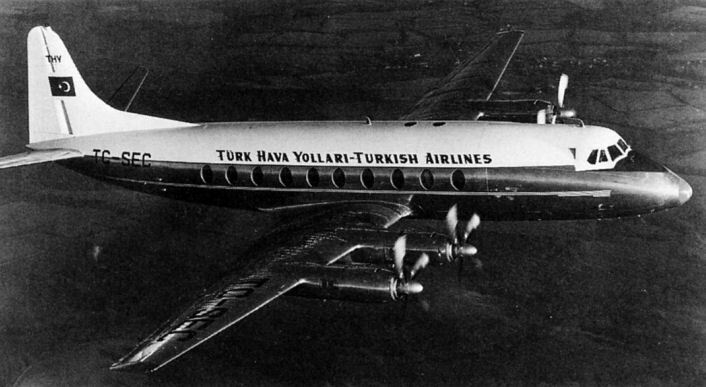 It made its first flight at Weybridge on 9/8/57. Первый V.700 (G-AMAV), 1950 год. Он никогда не принадлежал компании BEA, хотя в 1953 году получил имя "Endeavour" - по традиции семейства "Discovery". Неся на хвосте номер "23", самолет принял участие в гонках из Англии в Новую Зеландию. 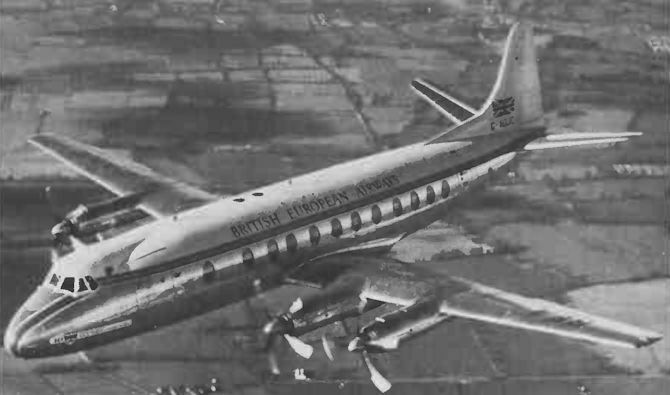 VICKERS VISCOUNT SERIES 800. 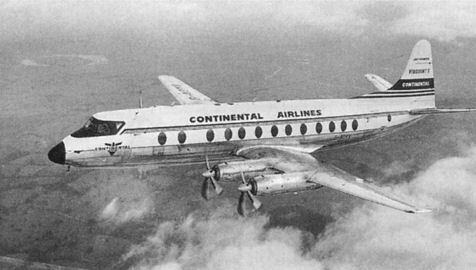 The Vickers Viscount 800 series was developed as a bigger, more economical development of the famous V-700 series, for operation over relatively short, high-density inter-city routes. The prototype, a V-802 registered G-AOJA, made its first flight at Weybridge on 27th July 1956, and appeared at Farnborough in B.E.A. colours, named R.M .A. Sir Samuel White Baker. Twenty-four 65-seater V-802s have been ordered by B.E.A. and a further fourteen of a later type. The first four, after AOJA, are already on the production line. Other 800 series aircraft have been ordered by Aer Lingus, K.L.M., New Zealand National Airways and Transair. The series will be developed, during 1958 and 1959, into the V-810/840, externally similar, but powered with the R.Da. 7/1 and 8 respectively. Salient features : The V-800 is complementary to, rather than a replacement for the V-700 series, and differs from the latter in several respects. 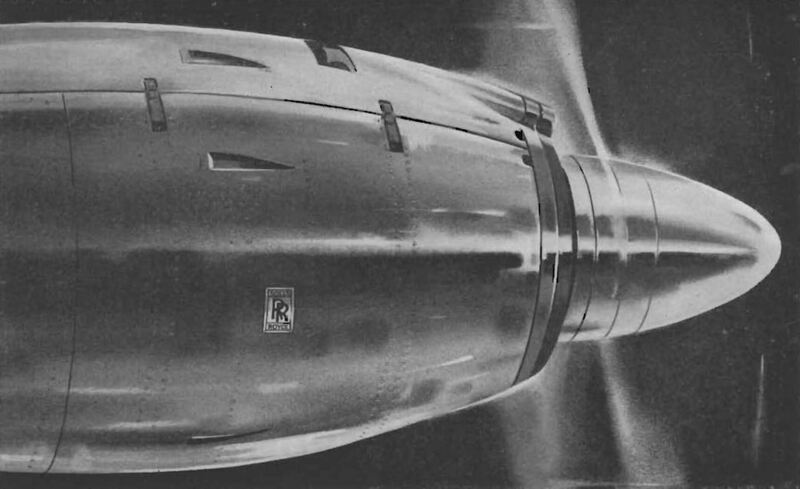 The fuselage has been increased in length by 3 ft . 10 in., and this, together with a backward movement of the aft pressure bulkhead, has resulted in a cabin 9 ft. 3 in . longer, enabling a maximum of seventy passengers to be accommodated over the fifty-three of the V-700. The doors have been redesigned and are rectangular, rather than oval. The Rolls-Royce R.Da .6 Type 510, which powers the V-800, is a turbo-prop with two-stage turbine and centrifugal compressor, and has been developed from the Dart. B.E.A. 's first Viscount 802 (G-AOJA) made Its first flight at Hurn on 27th July last. The last Viscount 802 for B.E.A., G-AORD, has an experimental pale blue finish on the underside of the fuselage. 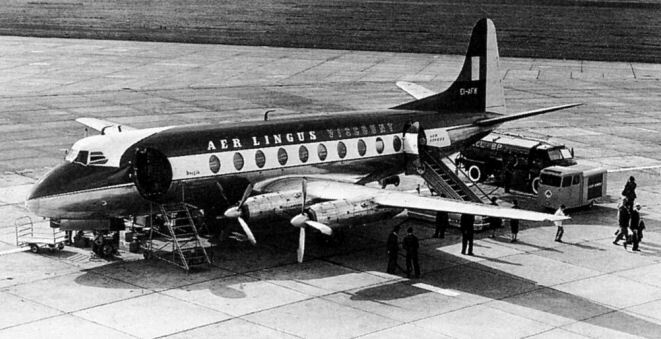 В 1954 году "Aer Lingus" заказала Viscount 707 для замены флота устаревших DC-3 и Wayfarer. Авиалайнер стал первым турбовинтовым самолетом компании, а в 1960 году был размещен заказ еще на пять машин - улучшенных Viscount 808. Aer Lingus have introduced a distinctive new colour scheme on their Viscounts (and Dakotas), with a green top and fin, and white flash and rudder. 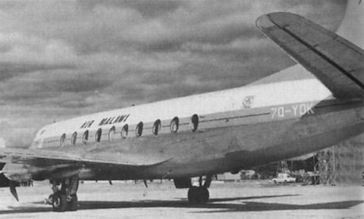 Formerly VP-YNA of Central African Airways, Viscount 7Q-YDK became the backbone of Air Malawi's fleet from 1967 to 1980. In Spotter's Notebook for July our colleague 'Aeroscribe' published a photograph of an All Nippon Airways Viscount K800 still carrying its original U.K. registration. We publish here a photograph of the second A.N.A. Viscount with its correct Japanese registration - JA8202 - on the fin. Saturday, 4 January 1992 marked the final Highland Division HS748 flight from Sumburgh. All 'OE' services to and from Aberdeen are now operated by BATPS. Kim Benson's picture shows a sight no longer to be seen. From left to right: G-BCOF HS748 BAW/BP charter; G-CSZB VC8 BAF/Shell charter; G-AOYN VC8 BAF/Shell charter; and G-BCOE HS748 BAW mainline scheduled flight to Aberdeen. G-BCOE is special as she operated the first HS748 flight of BAW into Shetland on 4 August 1975 and the last "budgie" flight to Aberdeen on 4 January 1992. 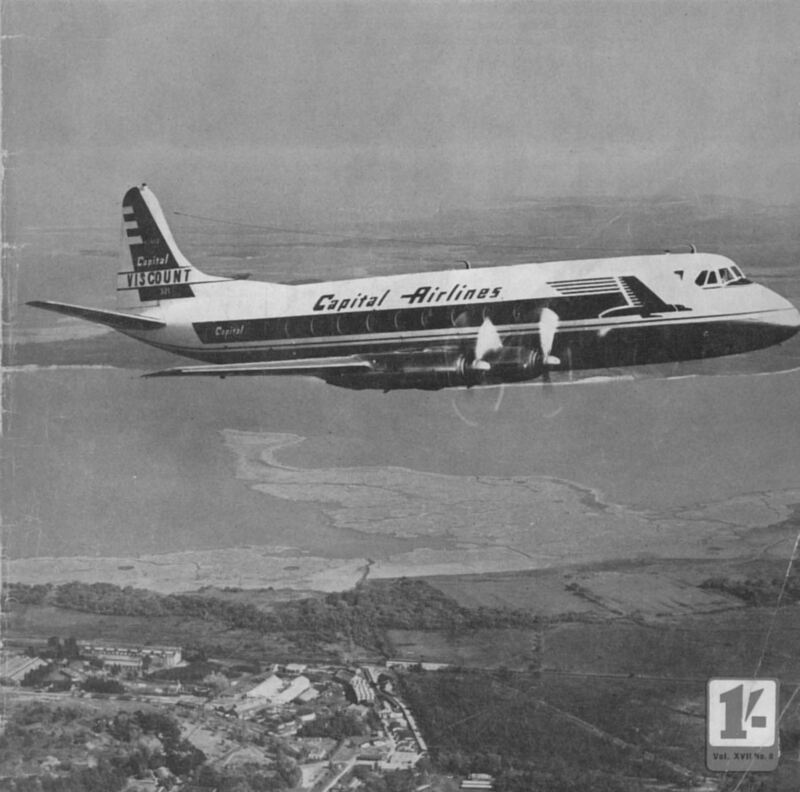 First of the sixty Vickers Viscount turboprop airliners on order for Capital Airlines of the United States. The Viscount is the first British airliner ever to go into domestic scheduled airline service in the U.S.
Viscount G-APDW, in its smart Eagle livery, is a welcome compensation for the loss of two familiar and well-liked old-timers. The Eagle Viscounts VR-BAX "Enterprise" (ex-G-APDW) and G-APDX photographed together at Blackbushe recently. 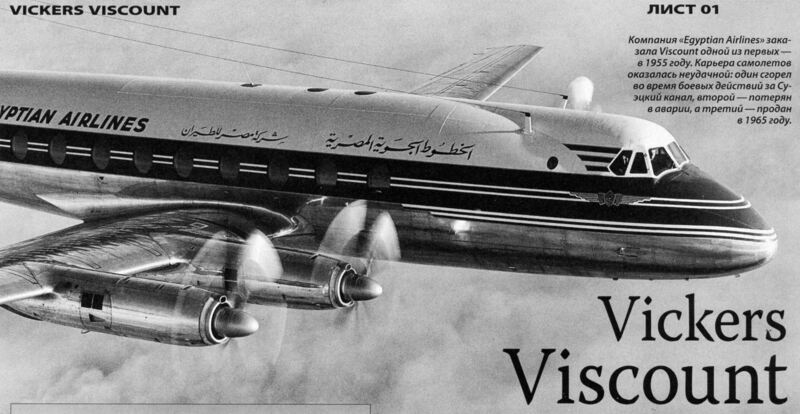 Компания "Egyptian Airlines" заказала Viscount одной из первых - в 1955 году. Карьера самолетов оказалась неудачной: один сгорел во время боевых действий за Суэцкий канал, второй - потерян в аварии, а третий - продан в 1965 году. With sunlight glinting off its polished-metal upper surfaces, Viscount 833 G-APTB shows off its new Hunting-Clan colours in the summer of 1959. Three 833s, fitted with higher-powered Dart engines for hot and high conditions, were introduced on Safari services from July 1959. Inter-City Airline's Viscount 708 G-ARGR is pictured on the apron at Sumburgh Airport, Shetland, on a typical winter's day. Никарагуа приобрела всего два новых Viscount. На снимке: вторая из этих машин, модификации 786D. The first of Lufthansa’s nine Vickers Viscount 814s, D-ANUN. 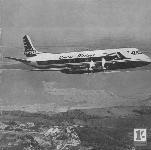 The airline was the first in Europe to operate the 810 series Viscount. Lufthansa’s Vickers Viscount, D-ANUN is the aircraft selected for Corgi’s latest 1:144th scale die-cast model. 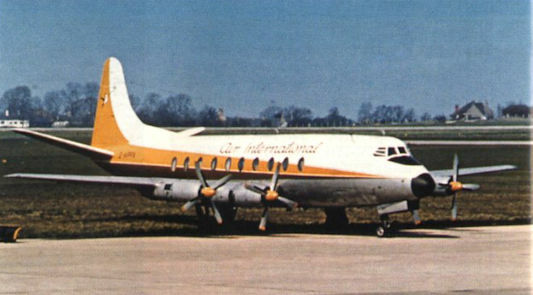 Delivered to the German airline in October 1958, the Series 814 moved to the UK register as G-BAPF in early 1972, when it was bought by British Midland. It later flew with Baltic Airlines until withdrawn from use in 1991, ending its days at Moreton-in-the-Marsh for fire training. The model should have enormous appeal depicting, as it does, one of the foremost airliners of the post-war years. It is also appearing in Parcel Force and BEA colours. 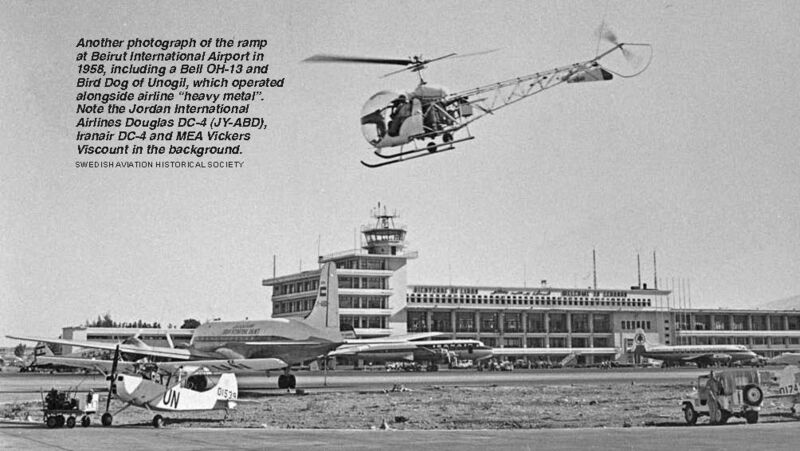 Another photograph of the ramp at Beirut International Airport in 1958, including a Bell OH-13 and Bird Dog of Unogil, which operated alongside airline “heavy metal”. Note the Jordan International Airlines Douglas DC-4 (JY-ABD), Iranair DC-4 and MEA Vickers Viscount in the background. Newest airline livery seen on a Viscount is that of Philippine Air lines, where two Type 784s will be used on the "Route of the Orient Star". Sixth Viscount for T.A.A., VH-TVF, has "slipper" tanks outboard of the engines. Each holds 145 gallons and together they increase range by 255 miles. Данный V.794 (№431) был одним из последних построенных базовых Viscount с коротким фюзеляжем. В октябре 1958 года самолет был передан турецкой компании THY, а впоследствии передан турецким ВВС и использовался как штабной самолет. Recent additions to the inventory of the Turkish Air Forces, the Turk Hava Kuvvetleri (THK), have included 10 Bell UH-1D Iroquois helicopters; sufficient Northrop RF-5A photographic aircraft to equip one squadron of the THK's 3rd Tactical Air Force, and three ex-THY Vickers Viscount 794s (shown) which are being used exclusively as VIP transports. A Viscount Type 764D, and is one of three for the U.S. Steel Co. 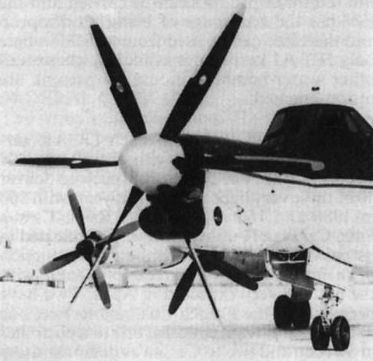 Note nose radar and slipper fuel tank on wing. One of the SOAF's three 800 series Viscounts that operate the Muscat-Salalah service. Note the auxillary wing tanks. 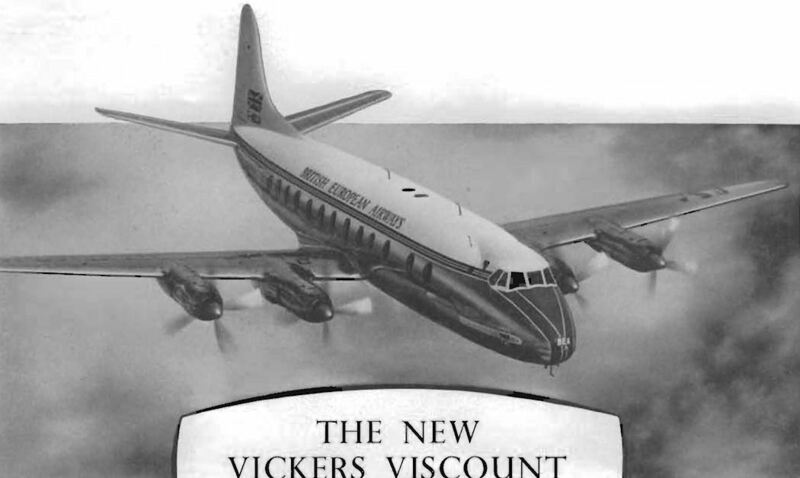 The 150th Vickers Viscount production model a Series 742 V.I.P. version, one of two (FAB-2100 and FAB-2101) destined for the Brazilian air force . Angela Waller (at left) awaits the next group of passengers with a colleague. 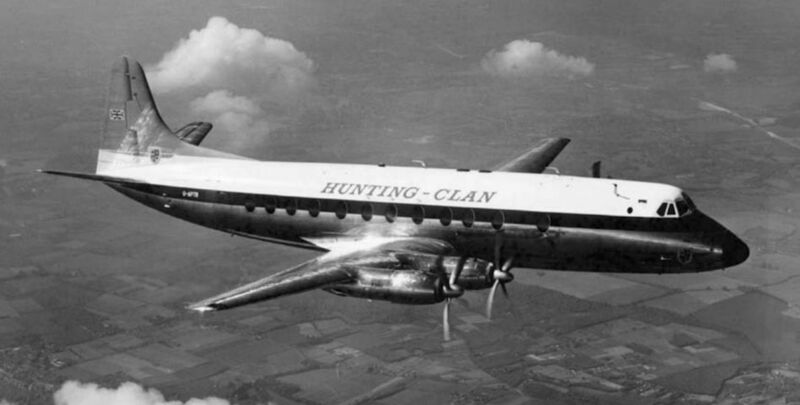 When the Viscounts entered Hunting-Clan service in 1957 a second air hostess was added to the crew - although, being a veteran of the single-hostess Viking and York Safari Services, Angela was regarded as a senior air hostess. 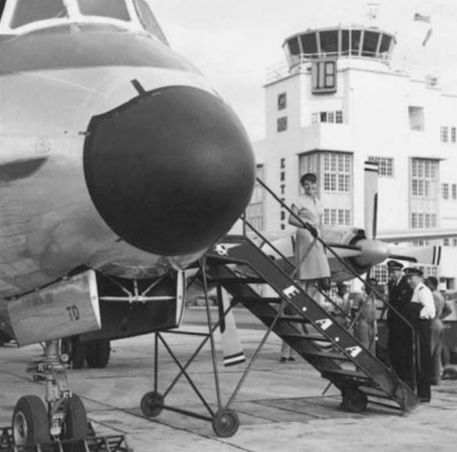 Angela Waller is seen, smiling from the steps of British United Airways Vickers Viscount G-APTD at Entebbe in February 1961. 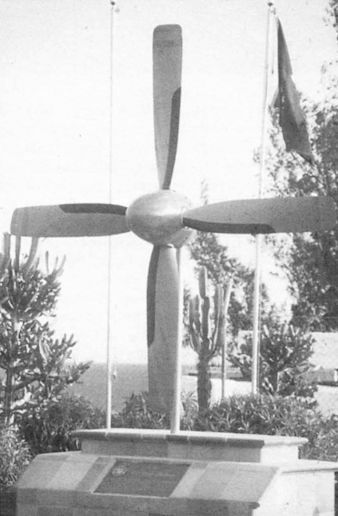 Paul Howard sent this view of a propeller mounted at the entrance to the Real Aero Club le Gran Canaria. He believes it comes from a Viscount, possibly ex-G-AOYM or ’OYO, which languished at Tenerife for some years. All 800 Series Viscounts are now assembled at Weybridge and all 700 Series on the Hurn production line shown above. Second and fifth machines in the line are the 754s G-APCD and 'CE (c/n. 243 and 244) ordered by B.O.A.C. for Cyprus Airways. С февраля 1982 года фирма "Pratt & Whitney" использовала этот Viscount 757 для испытаний нового ТВД PW100. Двигатель разместили в носовой части самолета для обеспечения работы в невозмущенном потоке воздуха. Послевоенные попытки британцев использовать турбореактивные двигатели Nene и Tay окончились неудачей. Последний установили только на втором прототипе Viscount (V.663). Как и оснащенный Nene авиалайнер Viking, он имел четыре тележки основной опоры шасси, размещенные по обеим сторонам гондол двигателей. 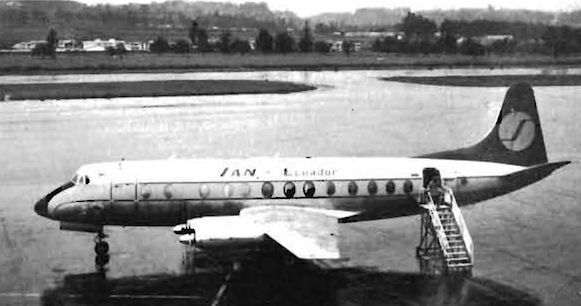 The Tay-powered Viscount, the world's first fly-by-wire aircraft at Seighford in 1957.